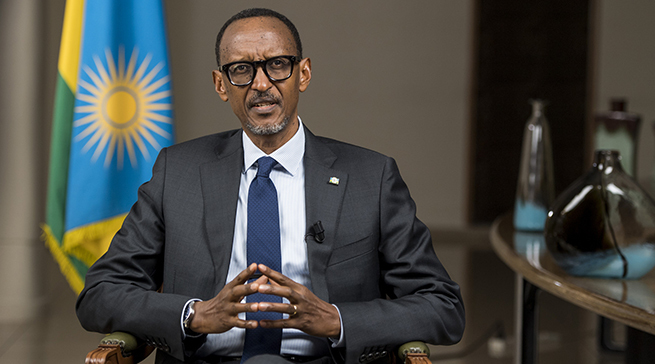 Rwanda’s President and chairperson of the African Union, Paul Kagame has been awarded the ‘African of The Year” award at the finale of the All Africa Business Leadership Awards held in Johannesburg South Africa. The annual All Africa Business Leaders Award, Africa’s most respected business awards distinguishes and honours leaders who have contributed and shaped the African economy, and are visionaries behind today’s outstanding businesses. Winners of the Awards exemplify the best in African leadership. They epitomize the core values of a successful leader, strength, innovation, ingenuity, knowledge and foresight values that are imperative to carving out powerful business in a Pan-African and global economy. How has President Paul Kagame shaped the African economy? Rwandan President Paul Kagame who advocates for the right mindset rather than more funding for Africa has always called on Africans to stop depending on donors to finance its own development. The leader, who is also the current chairperson of the African Union and is leading the continental body’s reform process believes this can happen if African nations tame illicit financial flows, improve taxation and add value to their raw materials. According to a report “Illicit Financial Flows, the economy of illicit trade in West Africa,” published by the Organisation for Economic Co-Operation and Development (OECD), on 20 February, 2018, Africa loses an average of $50 billion every year. Being one of the brains behind regional integration, Mr Kagame believes African countries can succeed if they work together. The African Continental Free Trade Area Accord signed by 44 AU member states in March at an extraordinary African Union Summit that held in Kigali is one of the continent’s latest deal on regional integration, the deal could go into force by the end of this year. Trade and investment are set to grow across the continent, creating opportunities for manufacturing and value addition. Mr Kagame has urged African leaders to improve their business environment for citizens and involve the private sector and other stakeholders to fully benefit from the trade deal. In April, Rwanda Development Board (RDB) was given an award for the second-best investment promotion agency in the East African region in attracting transformational projects at the Annual Investment Meeting (AIM) conference in Dubai, United Arab Emirates. The reforms that the Government of Rwanda has instituted have created a conducive business climate. Over the last 15 years, Rwanda has implemented 52 pro-business reforms, the highest number of business reforms in sub- Saharan Africa. The World Bank Doing Business Report 2018, positions Rwanda among the top 50 countries for doing business globally. In June 2018, German carmaker Volkswagen opened the first car assembly plant in Rwanda’s capital. Volkswagen, in setting up a factory in Kigali, joined a galaxy of star multinationals that have found Rwanda an irresistibly attractive investment destination. These include MTN, PPC, Starbucks, and Rezidor (Radisson) and Marriott hotels. Without an oversupply of minerals and other resources, Rwanda has had to learn to play to its strengths: tourism, both business and leisure, agriculture, and now services and manufacturing.